Posted 18 October 2018 by clareh & filed under Conferences/Public Events, Uncategorized. We were delighted so many were able to attend our recent AGM, including individual supporters as well as reps from RSD Devon, START in Plymouth, Exeter Amnesty group, Exeter Quakers and Exeter University. Special thanks to Souad Fadel for her informative talk about Exeter Mosque’s support for refugees. Exeter University Students in Dept’ of Geography under leadership of Dr. Jen Baglemen. A 10 0 students have produced wonderful awareness resources or held workshops to highlight issues of displacement and the ongoing need for sanctuary.We hope some may be digitalised to share online. Exeter City Football – Refugees Welcome dedicated match. 12 Exeter Primary Schools for hosting workshops. Exeter Phoenix and Exeter Picture Hse. 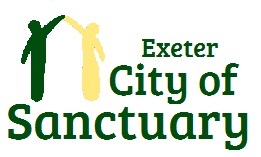 Exeter Quakers- who have pledged their support to ExCoS and become part of the Quakers in Britain ‘Sanctuary Meeting’ programme. Exeter Quakers have raised significant money for the direct support of refugees in Exeter and also supported national campaigning. Committee: We welcome Jonathan Marchant who has now joined the committee with Wendy M. Jen B. Clare H. and Phil C.